Sleepless Juggler: Little Help, Here? Tonight I was working on some food for the super bowl party we're having tomorrow evening. I like to get as much done ahead of time as I can. I was also putting away clean dishes from the dishwasher and folding and putting away laundry. I filled the washing machine with water and detergent and asked my youngest daughter to put the clothes from the hamper into the machine. I should have spoken more clearly. It's a big hamper, and there were enough clothes in it for at least 2 more loads of laundry. I turned my attention to the ground beef I was browning and really didn't think about the clothes again. My daughters are both terrific helpers. When I ask them to do something, I rarely have to redo the chore or check up on them. Many minutes later, I returned to the washer to find my eight-year-old STANDING on the washing machine straddling the opening. 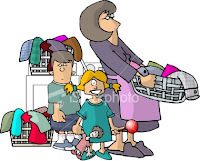 She was packing the clothes with all of her might into the machine, and every single article of clothing from the dirty clothes hamper was in the washer! It was one of the funniest sights I'd ever seen. She was pushing those clothes down determined to make them fit! She was very proud of her accomplishment! She is priceless! I appreciate the persistence and determination with which she tried to help me! We took quite a few articles of clothing out of the machine and set them aside to wait for the next load. It was still very full, and the washer shook wildly during both spin cycles. No problem for us, though. We've learned that 3 children sitting on top of a washing machine will keep it from vibrating and serve as a fun ride. There's never a dull moment in our house! That sounds hilarious! Why don't you join the Sunday Seven group since you do a thankful post each weekend? NADM in your house for sure! I'd like to have seen that sight!